Perfect Performance as penalties provide Clockhouse with the Alex Field Memorial Trophy! 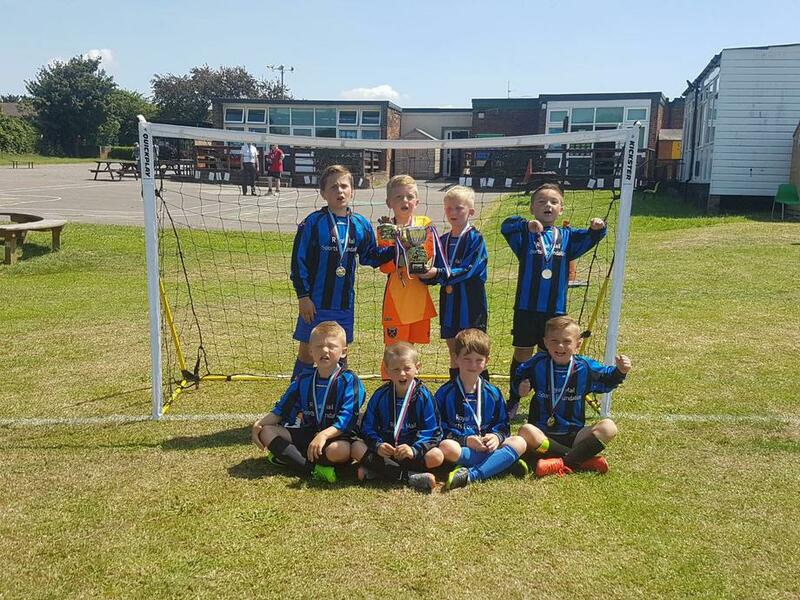 Clockhouse Primary School were invited to local neighbours Crownfield Infants for the Alex Field Memorial Tournament. Alex was a young Year 2 boy who had tragically died at a very young age. The whole competition was played in great spirits with all schools showing passion, team work and respect. Clockhouse started as they wanted to go on, beating St Patrick's 1-0, Harry H with the first goal of the morning. As the morning went on the Clockhouse children just seemed to click more and more and with our second game come our second victory, beating Rise Park 3-0 with a strong attacking display. Goals coming from a Karolis B and Dillan C.
Clockhouse were playing some brilliant football, but had their strongest test when they faced Parklands. Jamie S and Albie H working tirelessly in defence to limit the number of chances Parklands had. The game finished goalless and was one of the best games of football that you could of possibly wished for. It did not take the Year 2 boys very long to get back to winning ways however, Langtons were brushed aside in a strong 2-0 victory. Goals coming courtesy of the always impressive Karolis B and a rocket from Harrison D.
Clockhouse now had one foot in the final but with one pool game left they wanted to make a statement which they did winning 2-0 against our fantastic hosts Crownfield. Both goals being scored by Karolis B.
Clockhouse would now meet their toughest opponents Parklands in the final, a game that can only be described as an advert for children's football!!! Two teams playing with so much desire and dedication, doing everything to win. Clockhouse started the better of the two sides with Dillan C, Harry H and Karolis B all coming close to giving Clockhouse the dream start. As the game went on Parklands began to dribble more and the game was an end to end contest Noah S coming close at one end whilst Harry T was pulling off saves at the other end. With just over four minutes to play a Parklands player dribbled through and drilled the ball top corner giving Parklands the lead. This was the only goal Clockhouse conceded in the whole tournament and for the first time the boys would have to come from behind if they wanted to win. Clockhouse piled on the pressure and with literally the last kick of the game Noah S scored with a low hard shot from distance. With the score level at 1-1, extra time was played, sadly the extra time could not split the sides and the game went to penalties. Every player was keen to take a penalty and nearly every player did, in a penalty shootout that had everything you could wish for, with both keepers being the stars of the show saving numerous spot kicks. On the 7th round of penalties captain Harry T made a fantastic save and after composing himself to be the calmest boy on the field as he then stepped up and blasted the winning penalty past the Parklands keeper. Clockhouse won the Alex Field Memorial Football Trophy 4-3 on penalties. Mr Yarrow said after the tournament 'What a morning of great football, for a great cause! Crownfield were fantastic hosts. Credit must go to all of their staff including their two referees, especially the poor guy who had to take the whistle for the final! At Clockhouse we never make winning easy. This is our second penalty shootout victory in less than a week! There were so many boys I could of picked to play as Year 2 are blessed with some brilliant sporting boys but sadly I was limited to just 8. That being said I could not have asked more of the 8 boys who represented the school this morning, they were fantastic Clockhouse Citizens from start to finish! To only concede one goal in six games of football is a great achievement, these boys have set the standard now and I look forward to working with them again next academic year! A great time had by all!